1.875 m x 0.4 Hz. Range increases down and Doppler frequency increases to the right. angular and rotates is pronounced from frame to frame. The sequence shown spans about 45 minutes. 7.87 Earth radii of Earth's center (6.87 Earth radii from the surface) on Oct. 12, 2017.
computers are out of synch. Bill Ryan's lightcurves that suggests non-principal axis rotation (i.e., tumbling). 2012 TC4's absolute magnitude of 26.7 suggests a diameter within a factor of two of 15 meters. The spectral class is unknown. 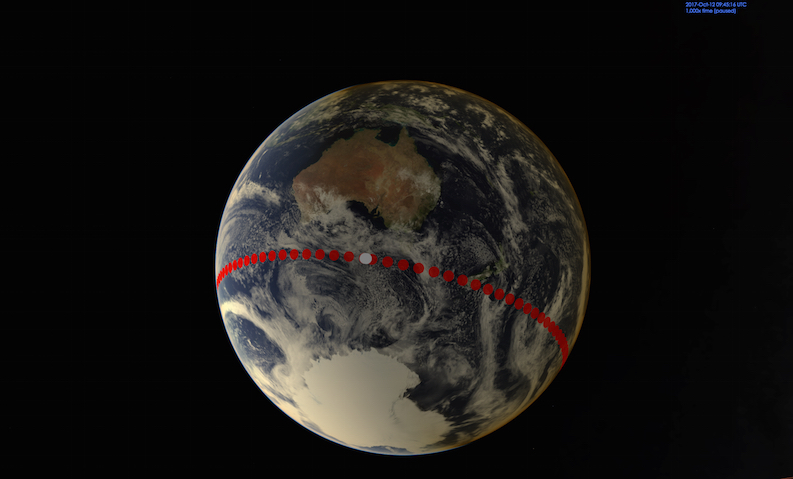 the moment of closest approach, when it will be too far south for Goldstone to track. We plan to observe this object with radar at Goldstone on several dates straddling the close approach. A preliminary schedule is available: Oct 9, 10, 11, and 14. Additional time on Oct. 12 may be added. at 13:22 UT. Time at Arecibo has been requested by J. L. Margot. We also plan radar speckle observations using both Goldstone (Oct. 11) and Arecibo (Oct. 12) to transmit. The close approach has generated some buzz on the internet but the chance of an impact in 2017 is zero. track will pass offshore over southern Australia. cohesive strength. We plan to check for spin changes using radar imaging before and after the closest approach. trajectory due to Earth's gravity, and the asteroid's heliocentric orbit will change. 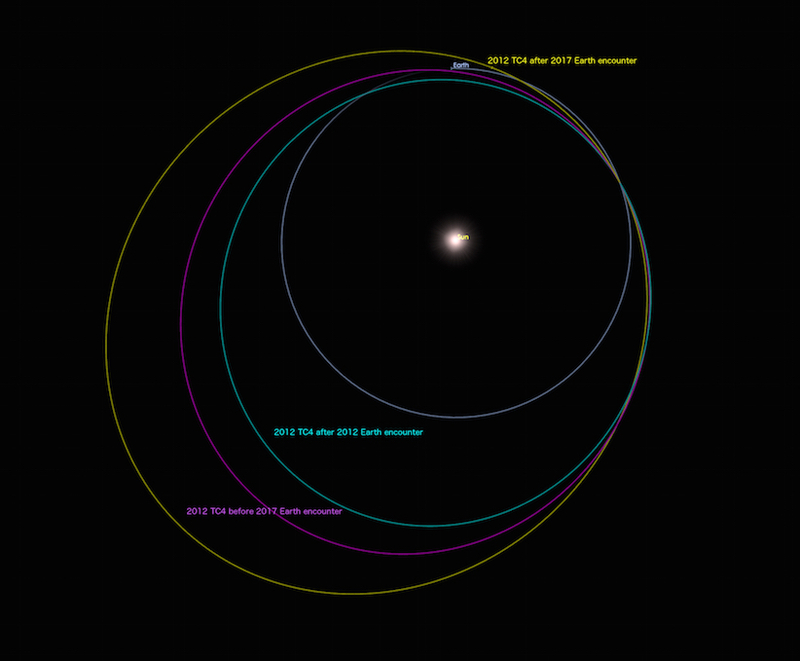 changes that have occurred after the 2012 flyby and that are predicted after the 2017 flyby. Between 2012 and 2017, TC4 was briefly in a 3:5 mean motion resonance with Earth. asteroid is currently under consideration. elements changed significantly during that encounter (see the discussion and graphics below). is shown in white and is off the southern coast of Australia to the west of Tasmania. Trajectories for solution 30 are probably very similar. heliocentric orbit. Computed using Solution 27.
from Oct. 2017-Jan. 2020. Each Earth encounter increases the asteroid's heliocentric semimajor axis and orbital period. Close approach to the Earth and Moon. From this perspective, 2012 TC4 comes into view from the right. of the asteroid from October 11-13 and straddles the time of the closest approach. background stars are shown, but the model of the asteroid is synthetic due to lack of information about its physical properties. 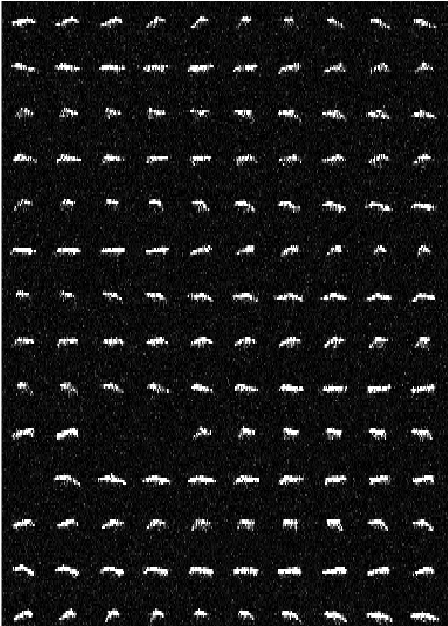 View of the October 12, 2017 encounter from the perspective of the asteroid with selected Earth-orbiting satellites also shown. solutions 22, 25, and 26. 2017 Sep 12: Solution 30 rise/set times and distances are nearly identical. During the first Goldstone window on Oct. 12, the RTT will decrease from 0.29 to 0.21 lunar distances, so the SNRs will increase by a factor of 3.6. During the second Goldstone window on Oct. 12, the RTT will double, so the SNR/RTT will decrease by a factor of 16. Round-trip light travel times are too short on Oct. 11-13 for monostatic observations so we need DSS-13, GBT, and/or Arecibo to receive. On Oct. 13 the RTT is so short that monostatic observations would acquire only about 2-3 seconds of data. There will be an attempt to observe 2012 TC4 with radar in Australia on Oct. 12 at the time of the closest approach. This appears in the DSN schedule below. We need to track below 27.5 deg with DSS-13 on Oct. 12. Use lower power than 80 kW. would also be an imaging target with the 37 m Haystack Observatory operating at X-band or W-band. Haystack will need an excellent ephemeris to avoid range smear, though. 285      0135 0225       DSS-13  GSSR   AST 2012 TC4           Bistatic: transmit at DSS-13. Extended request to 0310. Need to request Green Bank. 285      0445 0630       DSS-36  GSSR   AST 2012 TC4           DSS-36/ATCA bistatic (20 kW, 7190 MHz). Straddles the closest approach. 284  Oct 11  2012 TC4  DSS-14   0600-0910  2300-0210 Oct 10-11      4         150    None     TX 30 min into precal. Radar speckle from 08:55-09:10. The SNRs above all assume full power but we are currently running at 1/2 power with one klystron. Radar speckle observations had been requested on Oct. 12 between 14:15-14:45 UT but were cancelled. Tidbinbilla, Australia Rise/Set times (DSS-43) horizons = 20 degrees JPL/Horizons solution 30 Date__(UT)__HR:MN R.A._(a-appar)_DEC. delta 2017-Oct-10 07:14 *r 344.21362 -3.22448 0.00745610372361 2017-Oct-10 11:43 t 343.74589 -3.44253 0.00672502347683 2017-Oct-10 16:11 s 343.17175 -3.68600 0.00603930586196 2017-Oct-11 06:57 *r 342.35851 -5.21729 0.00369746397466 2017-Oct-11 11:29 t 340.83430 -6.21524 0.00295466163324 2017-Oct-11 16:00 s 338.34678 -7.71303 0.00225897274877 2017-Oct-12 03:39 *r 311.44363 -31.87521 0.00046536127344 2017-Oct-12 05:29 *t 250.44204 -47.38985 0.00029535310276 2017-Oct-12 07:04 *s 193.14264 -25.64095 0.00039370510704 2017-Oct-12 19:28 *r 160.97238 7.91165 0.00227466226942 2017-Oct-12 23:10 *t 158.82726 9.24983 0.00284724575858 2017-Oct-13 02:53 *s 157.39469 10.04724 0.00345342492778 2017-Oct-13 19:20 Cr 156.17708 11.81044 0.00606005455563 2017-Oct-13 22:56 *t 155.67774 12.03616 0.00661518084910 2017-Oct-14 02:32 *s 155.25731 12.17744 0.00719848985243 The first view period on October 12 encompasses the closest approach at 05:42 UT. 2012 TC4 would be a very strong radar target using any of the Canberra DSN stations to transmit (even transmitting only 20 kW) and the ATCA or Parkes to receive. Maximum sky motion is about 0.627 degrees per minute at the time of closest approach, or about 37 arcseconds/second. Solution 40 pointing uncertainties are about 1/2 of those from solution 34.
we could see a bandwidth of about 10 Hz. axis rotator, then we might see it right along its spin axis. 5. 1/8 usec ranging to really pin down the ephemeris. Decide what to do next depending on the SNRs and the time remaining.